Shelby is a newly graduated homeschool student. She plans on attending college and majoring in Dance Education and Physical Education as well. She has had experience teaching and assisting with dance and physical education for 5 years already! She is very excited to be joining our staff this year and we look forward to welcoming her as a teacher. All classes are $40 per month except Homeschool P.E. and Strategy Games which are $20 per month. Discount given for 3 $40 classes - $10. Please see website for payment guidelines. I understand every effort will be made to contact a parent or emergency contact. If we cannot be reached, I give my consent for the emergency room physician to treat my child. 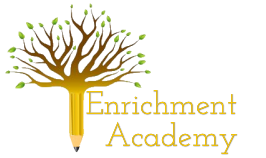 By registering with Enrichment Academy, we are committing to provide your student with a high quality educational experience. By signing this commitment letter, you as the parent, agree to be responsible for the monthly payments assigned to the classes your child is registered for. Withdrawal after August 1, 2015 does not void the financial obligation. A DROP FEE WILL BE ASSESSED IN THE EVENT YOU DECIDE TO DISCONTINUE CLASSES WITH ENRICHMENT ACADEMY. The drop fee will either be paid through checks collected at the first of the year or through the credit card on file with Enrichment Academy. The drop fee will not exceed more than 50% of tuition still owed for the year, but an evaluation of current circumstances may result in a lower drop fee decision. The yearly registration fee and insurance fee is non-refundable. Post-dated checks for each month will be deposited on, or around, the first of each month (They will NEVER be deposited before the 1st. All credit card/debit card transactions will be posted on or around the first of each month. I understand that a return check fee of $30 will be charged in event a check is returned. I understand the above financial obligation and agree to provide payment in full or pay a drop fee in the event of class discontinuation. Acknowledge and fully understand that each member/participant will be engaging in activities that involve risk of serious injury, including permanent disability and death, and severe social and economic losses which might result not only from their own actions, inactions, or negligence but the action, inaction, and negligence of others, or the condition of the premises or of any equipment used. Further, that there may be other risks not known to us or not reasonably forseeable at this time. Release, waive, discharge and covenant not to sue Enrichment Academy its affiliated clubs, their respective administrators, directors, and other employees of the organization, other members/participants, sponsoring agencies, sponsors, advertisers, and if applicable, owners and lessors or premises used to conduct the event, all of which are hereinafter referred to as “releases”, from any and all liability to each of the undersigned, his or her heirs and next of kin for any and all claims, demands, losses or damages on account of injury, including death and damage to property, caused or alleged to be caused in whole or in part by the negligence of the releases or otherwise.